The Multiple Gun Motor Carriage M16 is a Rank II American self-propelled anti-aircraft gun with a battle rating of 2.3. 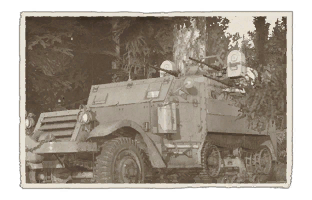 It is one of the first American vehicles to be released with the American ground tree in Update 1.45 "Steel Generals". Unlike its predecessor, the M13 MGMC, the M16 is equipped with not two, but four .50 caliber machine guns mounted on a Maxson M45 Quadmount to fight against enemy aircraft. The point of the vehicle is to protect the team against threatening aircraft, it does so quite unusually when compared to other nations SPAA of this rank. Other nations SPAA come equipped with cannons, like the Sd.kfz 6/2 of Germany that comes equipped with the lethal 37 mm Flak 18. The M16 MGC uses several HMGs to shoot down hostile aircraft with a hail of bullets that focuses on volume-of-fire rather than damage-per-round. Multiple heavy machine guns harmonized together allow for surprisingly decent self defense against poorly armoured enemy tanks and equipment. Suspension bogies are 10 mm thick, suspension wheels are 15 mm thick, and tracks are 7 mm thick. Front wheels provide 2 mm armour. Default API-T / I / AP / API-T These rounds work well until the others are researched. API API-T / AP-I / API-T These are absolutely devastating in the AA role with slightly less performance against enemy tanks than AP. AP AP / AP / API-T These are best against enemy tanks at close range and do good damage to planes. APIT API-T Better than API in all regards but not as good against tanks as AP, this is the belt choose in almost all situations. Since every bullet is a tracer makes destroying aircraft much easier and detect-ability is not greatly increased over AP-I, however is increased a bit over AP. First of all go to a good open spot, most times it is enough to stay in the spawn point. Best ammos for this vehicle are API (Armour Piercing Incendiary bullet) or APIT (Armour Piercing Incendiary Tracer bullet), as the specialized AP belt doesn't offer a significant advantage. "The Meat Chopper" is inaccurate when enemy planes are operating at high altitudes, but in these cases its function is more psychological than effective. Shooting short bursts at enemy planes at high altitudes will show them that the team is always covered by AA fire and it won't be an easy task a ground attack. When an enemy is diving, the best way to defend the attack is creating a thick fire curtain with prolonged bursts. The most vulnerable moment for aircraft is, when they just dropped bombs or rockets and climb again. They´re flying very slow and become easy targets. Take care if planes are attacking. Fighters with their MG´s and cannons are a great menace. So start moving while firing and take cover behind trees or even buildings. Watch out for remaining ammunition. The M16 MGMC has 800 rounds to shoot but reloading is very slow, making the M16 MGMC and the team vulnerable in the worst moments. More than 200 rounds is a good margin. Don't try to do anti tank tasks, the M16 MGMC is equipped with 50 cal. Machine guns not an 88 mm gun, so stay at spawn point and do anti-aircraft work. The machine gun tracers can reveal enemy snipers position shooting, allowing team mates to see them, but it's not advisable. In addition artillery barrages are very dangerous, move immediately and relocate. Powerful guns that can shred planes with well aimed bursts within 1 km. API shells are powerful enough to damage or even destroy enemy light tanks and other SPAAs. Fast on flat ground and can remarkably speed through terrain that would impede wheeled vehicles. 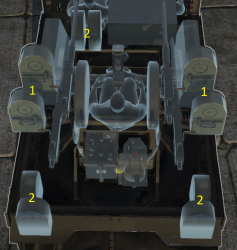 Can turn in place, compared to other wheeled SPAA. Fast turret traverse allows to follow aircraft easily. Can shrug off rifle caliber ammunition (<7.92 mm) quite easily. Fast reverse speeds, can evacuate an area quickly if necessary. Armour will not resist HMG fire and shrapnel. A nearby explosion will seriously damage the vehicle and injure or maim the crew. Fighter aircraft can destroy this vehicle, especially cannon-armed fighters. Can not hurt vehicles to a full extent of its rank and Battle Rating, excluding SPAA trucks and half-tracks. Engine catches fire easily and vehicle can be "tracked." No weight to pull: Towing or pushing allies is nearly impossible, unless it is a lighter vehicle. Prone to tipping over when turning at high speeds or travelling across steep inclines. Only 1 spare crew member. The role of a mobile anti-aircraft vehicle in the US Army was seen as necessary in order to protect ground troops from enemy aircrafts at any place of their deployment. The first such development was the M13 MGMC, which was an anti-aircraft system of two .50 cal machine gun on the back of a M3 Half-Track car. The M13 served with some success, but by 1943 an upgraded version was in production. 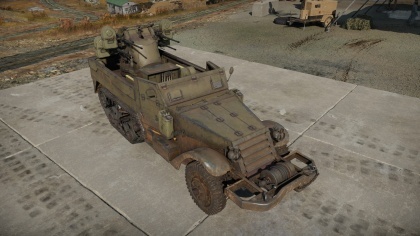 The new vehicle in development was an improvement over the M13 MGMC from replacing the two .50 cal machine guns with four instead, while still based off the M13 design by using the M3 Half-Track as the chassis. The prototype was called the T61 MGMC, but once accepted at the Aberdeen Proving Grounds, it was designated the M16 Multiple Gun Motor Carriage. During the evaluations, some changes to the design was made, including the addition of an gun shield. Production started in May 1943 and continued on until March 1944 with the production of 2,877 M16 MGMC vehicles by White Motor Company. An additional 568 M13 and 109 T10 Half-tracks were also converted into M16 vehicles for a total of about 3,550 M16 units made. The M16 MGMC saw service in early 1944, replacing the M13 that came before it. Deployment of the M16 MGMC is usually alongside the M15 CGMC, another anti-aircraft weapon equipped with a 37 mm autocannon as well as two .50 machine guns. The M16 MGMC was very popular with the troops as not only was it able to take down low-flying aircraft with relative ease, it was also used in a infantry support role where it earns the nickname "The Meat Chopper". The ability to provide covering fire with its four .50 caliber machine guns give the M16 a huge firepower advantage over the standard infantry and in some cases, were used to cut down trees where snipers were suspected to be hiding. The M16 also saw service with the Allies in the British Commonwealth and the Soviet Union, where they make use of it in the same way America did in anti-aircraft and ground support roles. The M16 saw sevice in the Italian Campaign, French Campaign, and the Battle of the Bulge. After World War II, the M16 MGMC still saw service in American forces in the Korean War, as well as by their South Korean allies. While still superb at a ground support role, the advancing technology in aircrafts make them more advanced and durable to the .50 caliber machine guns and so its effect as an anti-aircraft gun has diminished. By late 1951, the M16 MGMC was declared a "limited standard" and were gradually retired from US service, though they continued to serve until the end of the US involvement in the Korean War. The M16 MGMC was finally declared obsolete by 1958. This page was last edited on 13 January 2019, at 19:23.